Smart Factoree TM and the Knowledge Base TM will help you manage your manufacturing processes effectively by diminishing your equipment downtime and manufacturing costs. It doesn’t matter if you’re a small, medium or large enterprise, this great software will increase the confidence of your employees toward their production facilities and manufacturing processes. You will, in return, achieve greater productivity and profitability with the right tool to compete in this global world. Smart Factoree is a program designed for automated industries or industries wishing to become automated. Smart Factoree help to increase productivity and management of your business. User friendly, Smart Factoree is adapted to all kind of industries. Smart Factoree will help you coordinate the work in your industry. 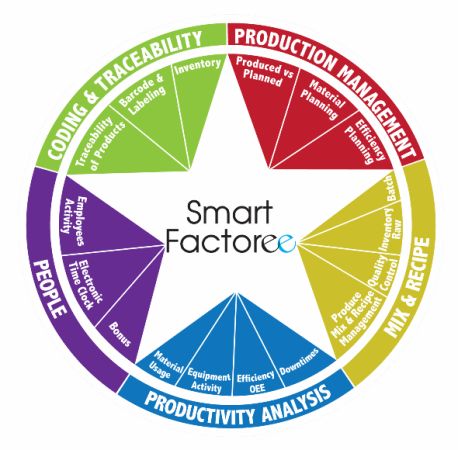 Combining five modules, Smart Factoree offers industrial production managers and team leaders the tools they need to coordinate their work, anticipate their needs and analyze their production. This software includes five of the most powerful and most comprehensive modules . You can easily plan your production, anticipate your needs, manage your employees and the traceability of your products. Smart Factoree offers you everything you need for your industry with control and monitoring of your equipment . Integrating Smart Factoree is quick and easy. Your product is compatible with any type of PLC (Allen-Bradley, Omron, Siemens, SCADAPack, …). Please feel free to contact us for information.